I took this photo last August around midnight, by the light of a nearly full moon. 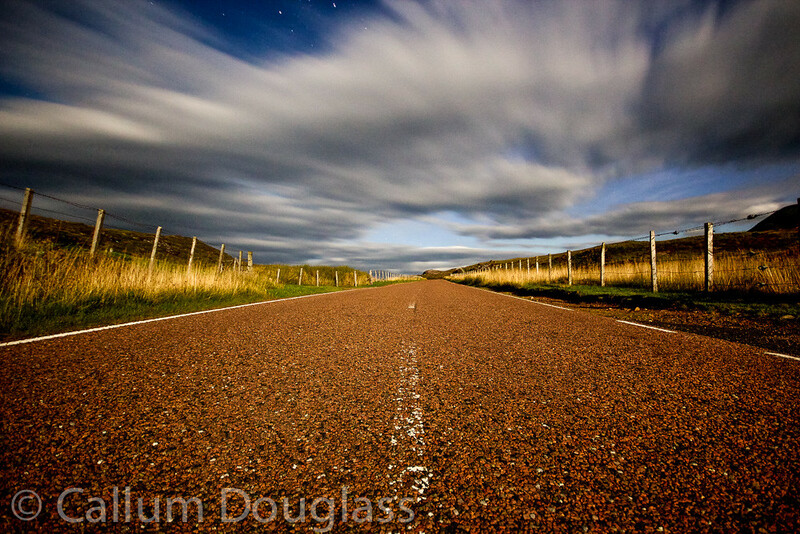 It was taken on the road from Torridon to Shieldeg, Scotland, just outside of Balgy Lodge. I just finished reprocessing it and I'm looking for any C+C. You can see by the star trails that it is a long exposure - I know there is not that much light at midnight here. I might be inclined to take the bottom third off. Sorry .. nice shot !! It is indeed a long exposure, 30s at 10mm, 16mm equivalent, f/4, ISO 800. Looking back, I wish that I tried a 120s exposure at ISO 200. There is absolutely no light pollution there, the only source of light was the moon. Did you use any nd filter? For me the sharpness of the road and the blurring of the clouds give me the feeling I am actually traveling down the road. I like that. Great shot. I like it too! Personally, I like how you included so much of the road as a foreground element. Nice job! Looks great. I'm surprised at how much color you were able to milk out of a moonlit scene. If I hadn't read your post, I would have assumed it was taken within 1-2 hours after sunset. The stars make the composition. There was no ND filter, I had to shoot it at ISO 800. I wish that I had thought about it at the time, but I was so excited with the results. I wish that I shot it at f/5.6, ISO 200, and 240sec.